A matching network optimizes the transfer of power from a source to a load by maximizing the power delivered to the load while meeting other performance specifications. For small-signal RF circuits, the power delivered to the load is maximized by conjugate-matching it to the source with a matching network. For power amplifiers, a matching network transforms the load impedance into Vmax/Imax, the ratio of the maximum rated voltage of the active device divided by the maximum current it can deliver. 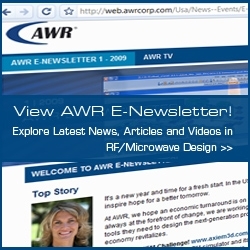 In any case, maximum power transfer is just one aspect of the design of an RF circuit. Others include noise performance, stability, and linearity. In any case, maximizing the power delivered to the load is just one aspect of the design of an RF circuit. As a result, optimizing a matching network in order to meet all the design specifications requires multiple iterations, which can become very laborious and tedious even with the aid of a circuit simulator. The use of the Smith Chart or a Mathcad/MATLAB routine can not only make the procedure less burdensome but also help the designer visualize things better as the circuit is fine-tuned.nnImpedance matching networks can be designed using lumped inductors and capacitors or transmission lines. Traditionally, transmission lines have been implemented exclusively on PCBs. One of the advantages of the tiny dimensions of ICs is that transmission-line effects can be neglected in many cases. Propagation delays are usually dominated by components'' parasitics. In recent years, the possibility of designing CMOS circuits that operate at millimeter-wave frequencies - 30 GHz and above - has been explored. At these frequencies, long IC metal traces need to be regarded as transmission lines. In fact, transmission lines can be designed inside a silicon IC at these frequencies, and some people have done just that. In any case, in dealing with transmission lines the designer could also greatly benefit from the use of assisting tools such as EM software, Mathcad/MATLAB routines, and transmission-line tools, both to speed up the design and to get a better understanding of the circuit at hand. G. Gonzalez, Microwave Transistor Amplifiers: Analysis and Design, 2nd edition, Prentice Hall, NY, 1997, p. 92. S. Cripps, RF Power Amplifiers for Wireless Communications, 1st edition, Artech House, Massachusetts, pp 12-14. J. R. Long, "SiGe Radio Frequency ICs for Low-Power Portable Communications", in Proceedings of the IEEE, Vol. 3, No. 9, pp 1598-1623, Sept. 2005. B. Razavi, "A 60-GHz CMOS Receiver Front-End", IEEE J. Solid-State Circuits, Vol. 41, No. 1, pp 17-22, Jan. 2006. B. Razavi, "A Millimeter-Wave CMOS Heterodyne Receiver With On-Chip LO and Divider", IEEE J. Solid-State Circuits, Vol. 43, No.2, Feb. 2008. B. Afshar, Y. Wang, and A.M. Niknejad, "A Robust 24-mW, 60-GHz Receiver in 90-nm Standard CMOS", ISSCC 2008, Session 9, pp 6-8. This tool calculates the Ls and Cs value of the lumped balun that transform single ended impedance to differential impedance. From his book RF Circuit Design. Great stuff! Click on M-files on the left frame. Freeware uses Smith Chart to do impedance matching. Very popular! Freeware to design transmission lines, nice. Impedance matching tool using the Smith Chart. Free. Looks *nice* and the price is right! 24 TL online tools in Java, very nice! Various note sets on impedance matching. Very nice. Implements silicon NLTLs for edge-sharpening of very high frequency signals. Basic equations of TLs, Smith Charts, microstrip lines. Explores limits of propagation speeds of signals over on-chip interconnects. Presents idea of modulating a digital signal in order to take advantage of the transmission-line effects of on-chip interconnects. Modeling of copper interconnects with and without ground shielding is presented and verified with measurements of structures in 0.13-um CMOS. Design and measurement of semi-coaxial lines in 0.18-micron CMOS and comparison to microstrip and CPW's implemented in the same technology. Very good RF resource. From a reviewer: "...An excellent, concise, introduction to RF circuit design. The emphasis is on the practical aspects relating to RF circuit design..."
S-parameters and matching networks followed by microwave amplifiers. Very good book. from description: "...The text's most significant feature is its method of simulating crosstalk between closely spaced traces on a circuit board and providing design tools for its control. The author explains methods that he has successfully used to simulate multi-wire transmission line signal propagation; provides explanations that enhance students' understanding of propagation and crosstalk; and uses mathematical algorithms for their numerical evaluation..."
From an Amazon review:"...Many engineers face a large gap between the elegant simplicity of Maxwell's equations and the practical aspects of electromagnetic issues. Electromagnetics Explained by Ron Schmitt bridges that chasm..."
from description: "...this comprehensive volume will help engineers who work with digital systems, shorten their product development cycles, and fix their latest high-speed design problems...."
from description: "...reviews the fundamentals of electromagnetism in passive and active circuit elements, highlighting various effects and potential problems in designing a new circuit...."
From description:"...Topics covered include transmission lines and lumped elements, resonators, impedance matching networks, hybrids and couplers, filters, active and passive solid state devices, oscillators, amplifiers, detectors and mixers, microwave control circuits, frequency multipliers and dividers, computer-aided design, microwave integrated circuits, and future trends in microwave circuits. Appendixes cover S-parameters and ABCD parameters; transfer functions: Bessel, Butterworth, Chebyshev, Gaussian, etc. ; nonreciprocal components, and noise..."
From an Amazon reviewer:"...This book is the bible of Microwave Filters, Impedance-Matching Networks and Coupling Structures. The novice can jump right in and start designing structures. The experienced engineer will find in-depth study and insight into many rf structures..."
From and Amazon reviewer:"...Not only is this book fantastic on its treatment of practical rf design, but it also has (on an included 3.5" disk) five Excel spreadsheets -- with 100's of formulas -- that make such wireless designs far easier to calculate. I strongly recommend Mr. Vizmuller's book for both wireless circuit and systems design..." Another:"...Many formulas with Excel disk to calculate. Very impressive and saves hours and hours of headaches and math. ..." One question: Does *anyone* out there still own a 3.5" disk drive?? Anyone?? A 3.5" disk holds about a minute and a half worth of 128 kbps MP3 audio, if memory serves.